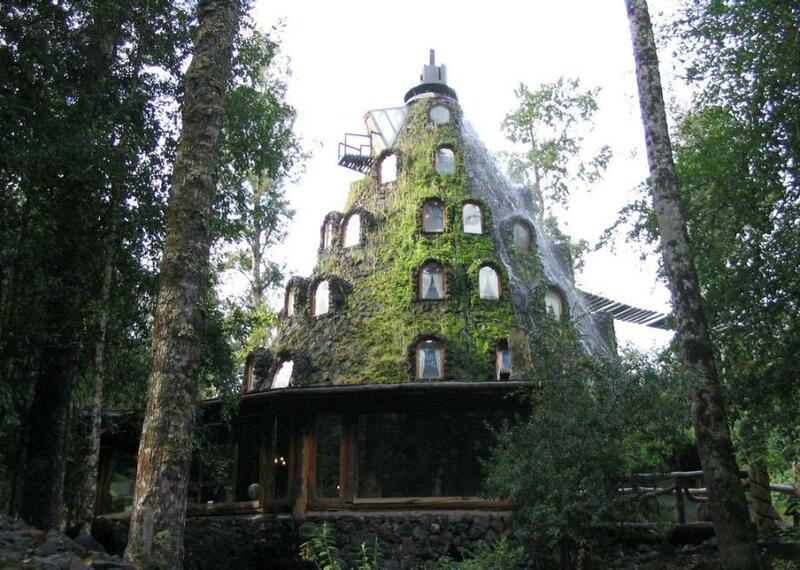 Chile’s Montaña Mágica lodge looks like it belongs in Middle Earth. The otherworldly hotel looks as though it was dug into a natural stone spire, but the Montaña Mágica Lodge was in fact man-made. Using locally sourced lumber and stone, the creators of the lodging built up a tall cone. Water pours from the top down the sides in between the guest windows, running under rich layers of jungle foliage growing on the exterior. Adding to the magic of the site is the rope bridge that leads to the entrance near the top of the volcano-like structure. Inside, each of the cozy suites is named after a local species of bird, and all feature a selection of modern amenities that rival even fancier hotels in less remote parts of the country. And if the strangeness and beauty of the hotel itself fails to impress, it offers a number of other attractions. Among the offerings are hot tubs “made out of huge trunks of trees, dug out, and then filled with hot water perched on a deck overlooking the forest.” There is also a mini golf course built into the forest itself, using the natural world as the obstacles, and there are various outdoor activities such as horseback riding, rafting, and hiking. Of course, getting to such a magical place takes a bit of doing. The ride to Montaña Mágica Lodge is at least two hours from the nearest airfield. It is a small price to pay to experience a location that looks like it belongs in Middle Earth.